Newsroom / Resources / Colleagues in the Community Spotlight / Marcia Snyder named "2010 United Way Volunteer of the Year"
Steve Leaman (from left), Senior Branch Manager Fond du Lac and Tina Potter, Executive Director of the Fond du Lac Area United Way present an award to Marcia Snyder, Bank Teller Supervisor Fond du Lac, 2010 United Way Volunteer of the Year. Marcia Snyder, Associated Bank Teller Supervisor at the Fond du Lac branch location was named "2010 United Way Volunteer of the Year" by the Fond du Lac Area United Way. She was recognized at the Annual Volunteer Recognition & Appreciation Luncheon and the award was proudly presented by her Senior Branch Manager, Steve Leaman. "I was able to present her the award at the luncheon and was even able to keep it a surprise," said Leaman. Snyder was involved with the United Way this year serving as Campaign Captain, and recruited Leaman as Team Captain. Snyder is heavily involved with numerous local non-profit organizations. United Way is a non-profit organization that promotes global community service, provides resources to those in need, and serves as a basis for improving all lives. 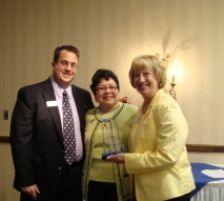 Congratulations to Marcia Snyder for your exceptional efforts in helping the lives of others.